All month, my calendar has been tormenting me. With each new month comes a new recipe. 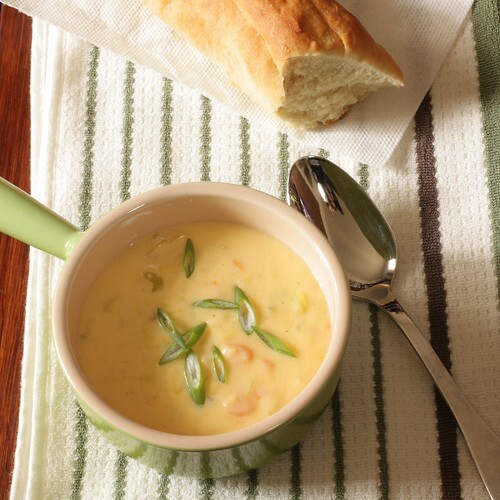 When I first flipped the page for April, I hoped I wouldn’t have cause to make April’s recipe: Beer Cheese Soup. It was the first full month of spring! Who would want to make a hearty soup? 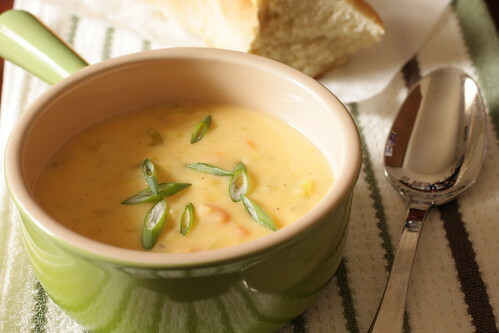 Well, I’ve had my heat turned on for most of the month, and finally, the image of a cheesy soup, combined with the thought of fresh baked bread was more than I could take. So on a cold, dark, rainy day, I took what I learned from making broccoli cheese soup to adapt Trega’s Beer Cheese Soup, then served it with warm baguettes. It turned out exactly as I hoped it would; the only thing more comforting on a cold day would be eating this soup in front of a roaring fire. Finely chop leeks (white and light green part only). Place chopped leeks in a large bowl of cold water; agitate the leeks then let them sit for 15 minutes to allow any dirt and sediment to sink to the bottom of the bowl. Carefully scoop the leeks out with your hands to another large bowl and dry with paper towels. 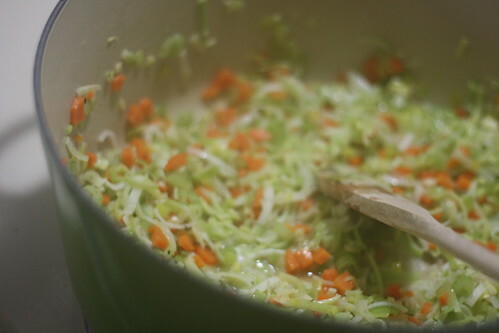 Finely chop the carrots and celery and add to the leeks. In a large pot or dutch oven, heat butter over medium heat. Add vegetable mix and saute until softened. Add flour and stir with a wooden spoon for 2 minutes. 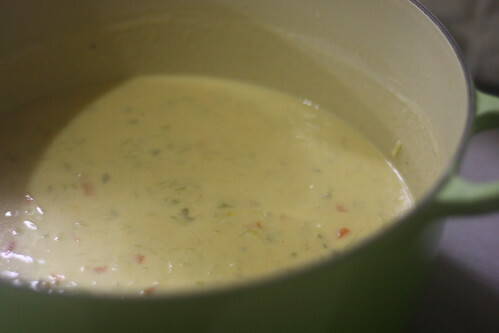 Slowly add milk while whisking; season with salt and pepper to taste. Add the mustard and the beer and raise the temperature to medium-high, whisking constantly. Bring to a boil, then reduce heat to low. Whisk constantly until thickened. 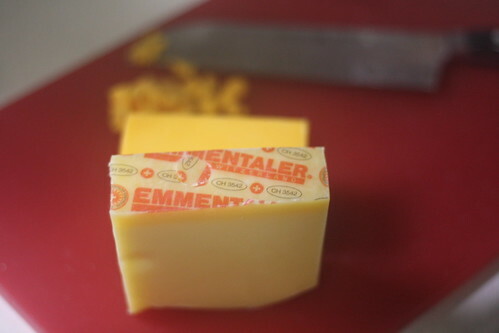 Remove pot from heat and stir in cheese, a little at a time, allowing each addition to melt before adding the next. Garnish with chopped green onions or croutons; serve with warm bread if desired. Heat up any leftovers over low heat the next day (after one day, the soup starts to separate a bit). Tip: For a weeknight meal, have the cheese shredded and vegetables cleaned and chopped ahead of time; pick up a baguette from the market or bakery and pop it in the oven for a few minutes to warm it through. Heat up any leftovers over low heat the following day. This looks amazing! I can’t wait to give this one a shot! My Madison Bistro by My Madison Bistro is licensed under a Creative Commons Attribution-Noncommercial-Share Alike 3.0 United States License. Free WordPress Themes courtesy of A1 Coffee Makers & Savvy CookingMy Madison Bistro Copyright © 2019 All Rights Reserved.